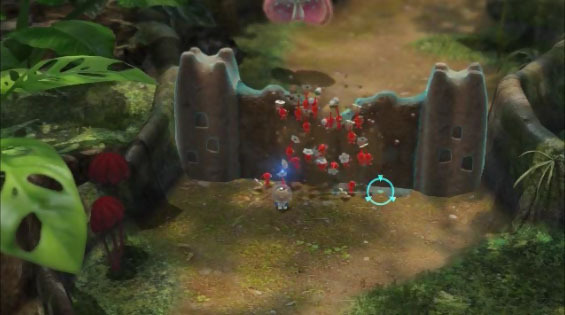 Pikmin 3 is considered to be a real time strategy game. There is a single player campaign and multiplayer modes and combat also. 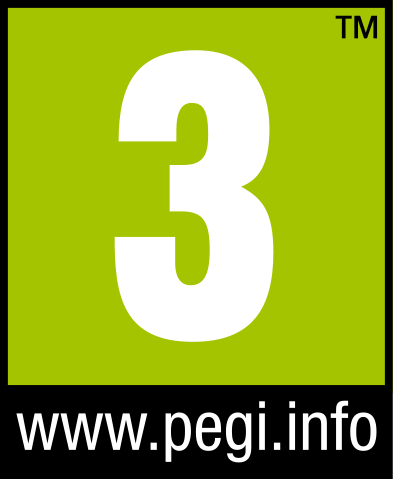 Pikmin 3 is a Nintendo Wii U exclusive. 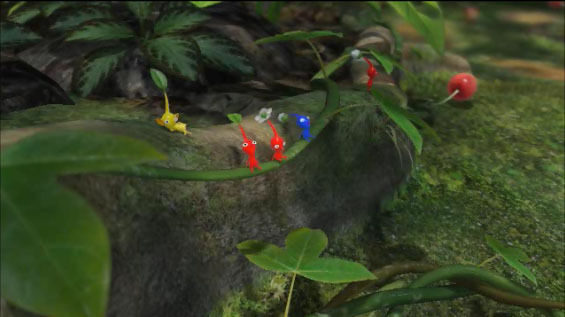 We remember when we first heard of this idea called Pikmin and the concept, we were not sold at first. Since then there have been two Pikmin games come out and each were outstanding and the series gets better with each game. Pikmin 3 so far the best of the three games and is fun from the start. There is a food shortage on the planet Koppai and three people are sent out to find food, seeds and items and bring it back to the planet. Alph, Charlie and Brittany are the three sent to find resources but they get separated and you must reunite with your fellow space travelers and find enough food. Pikmin 3 is just as much fun to play on the gamepad as it is on the TV screen. We spent a long time playing the game both ways. We did prefer using the TV not just because of a bigger screen but the gamepad is integrated very well with information on it when the action is on the TV. You spend as much time looking at the map on the gamepad trying to find your way as you do traveling around, the gamepad elements did not seemed forced at all but if you want to use the Wiimote instead you can do that too. You can spend your time splitting up your party into three after you find everybody or you can keep them all together, we did about 70% together and 30% apart. Trying to control and protect three parties at the same time was not easy that is why we spent most of our time keeping everybody in one place. The game has a lot of over the top boss battles with giant enemies to battle. Some are so big that they don’t fit on the screen and require you to figure out how best to defeat them. Even when we got frustrated and kept losing we wanted to still keep trying until we got it. You can only save after a full day in the Pikmin world and some of the bosses could take the entire day to defeat. This is fun but if you don’t get your Pikmin back to safety in time they get eaten by monsters when night comes. This might seem stupid but you actually feel bad when you have to leave a Pikmin behind because you did not get them back in the ship before the sun went down. The complaints are minor. There is no voice acting and for the current gaming world it seems lacking not to hear somebody say something. This game would do well with having a voice to go along with the look. Camera at times is a little slow to react and aiming sometimes is off. This becomes very frustrating during boss fights when you need perfect timing to attack at the right moments or when you are trying to pick something up and you can’t see how many Pikmin you need for that item because the camera will not swing into place to see the number needed. We were able to beat the game in just a little over 15 hours and the replay is very high. 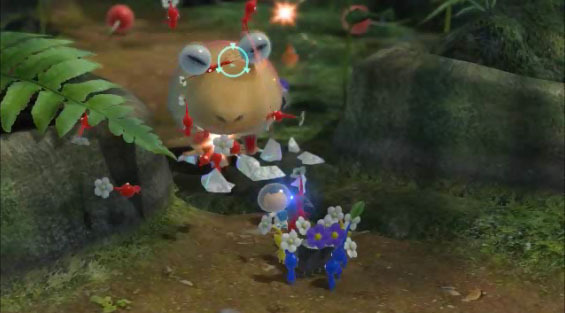 Pikmin 3 as has some mission modes like collecting treasures, battling enemies and defeat bosses to add some other gameplay plus there is a Bingo mode and you will have to play it to understand it. Plus, there is battle modes. Pikmin 3 is so fun we actually had to plug in our gamepad to play because the battery kept running down. We wanted to explore and find all of the hidden things and wished there was a little more to the story mode. You do get to see Captain Olimar and Louie as part of the story plot points from earlier games and even after you do everything in the game you want to keep playing so there is replay value here, mostly in the co-op and missions modes. The Wii U needs more games like this, fun and unique with a style of gameplay that Nintendo is known for. Keep you price under $45.00 and enjoy.